The itch to plant something is a symptom of spring fever all too familiar to gardeners . The cure usually involves a trip to the garden center for some plant-shopping therapy. If you’re not careful, you can wind up with plants (already in bloom) that make a good showing early in the season and precious little that looks fresh toward the end of summer, let alone into autumn. 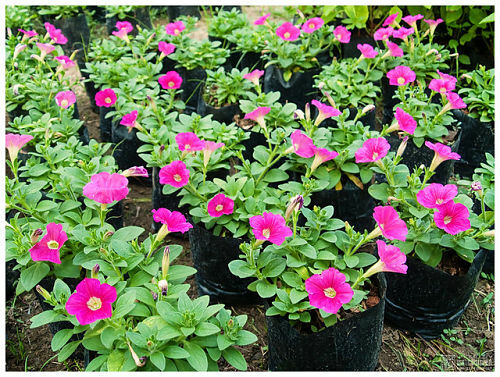 Get carried away by the newest and flashiest flowers in the greenhouse and you may even come home with labor-intensive plants that require a tiresome regimen of watering, fertilizing and grooming to look their best. Too often, as Milton Berle said, a thing of beauty is a job forever. Let me propose a different strategy, one that begins with a plan. The secret to a beautiful and more carefree garden lies in choosing reliable plants for each season that don’t require much input from you. These should be the garden’s backbone, deployed in broad swaths, with the more precious specimens few and close at hand – in your patio pots, say. Design experts recommend counting only up to three – and get spectacular effects from a limited array of plants repeated through the garden. As a reformed collector of every plant that catches my fancy, I have to say this really does work. I’ve become enamored of plants that can basically take care of themselves, are hard to kill and slowly increase to satisfying proportions without mounting hostile takeovers. Deer-resistance is important everywhere so I lean heavily on species that are not preferred. Let’s consider spring. Two of the most reliable stars of the season are flowering trees and spring bulbs. Your spring display could involve a redbud with its delicate rosy-purple flowers set off by a generous host of daffodils. Instead of the standard golden kind, choose instead some sparkling white varieties – or butter yellow ones. A bit later in the season the dogwoods bloom, and nothing is prettier under them than a carpet of woodland hyacinths. I favor the more robust Spanish ones (Hyacinthoides hispanica), which will bloom in shade with loose, fragrant spikes of flowers in pink, white or blue. Both of these tree-and-bulb schemes rely on volume. Since you only have to plant them once, use bulbs not by handful bur by the dozens and a hundred or more would not be incorrect. If your tree casts a pool of shade, consider integrating some old-fashioned bleeding heart plants (hardy perennials), which will spread their foliage and flowers over spent bulb foliage for a second act. I believe in one spectacular flower for every season and in spring, it’s peonies. Briefly at peak but oh, so beautiful, these are superb cut flowers and in a sunny spot with reasonably fertile soil, they are practically forever. 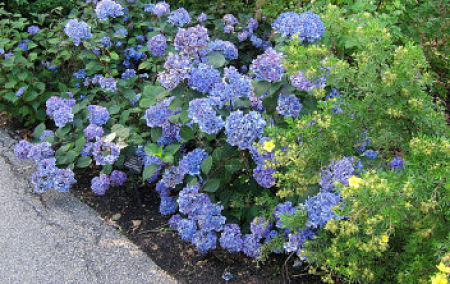 For summer, flowering shrubs might anchor the garden. The newer, reblooming hydrangeas (Endless summer series) are good for spots with afternoon shade and disease-resistant landscape roses (Knock Out and kin, Oso Easy) are excellent in sun. For sweeps of color in the garden, turn to reliable and deer-proof perennials like black-eyed Susans and phlox. Phlox can suffer from mildew but if they are planted to the rear of the border you won’t notice and Phlox maculata, including several nice varieties, is immune. Spider flowers extend their stems and bloom atop them all season long and will self-sow, so although they are annuals you need never replant them yourself. With these long-blooming summer workhorses, a vertical touch works well. Try the annual Salvia farinacea 'Victoria Blue.' Utterly trouble and pest free, it will form a mass 18 inches wide by about 24 tall and produce thin, cobalt blue spikes without ceasing until hard frost. Yes, of course, add whatever other plants you choose, but use these in quantity and your garden will always look lush. For a summer “special” consider a moonflower vine planted close to the patio to wow your guests with huge white flowers that fling themselves open at dusk. They are really special. Late-blooming flowers maintain a neat habit until their moment of glory in fall. Pristine white Montauk daisies are semi-succulent, drought-resistant and grow to shrub size; they’re good along driveways. 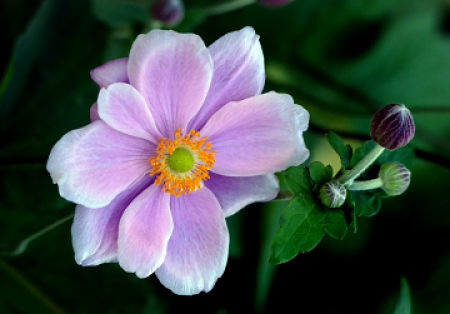 Japanese anemones will spread in a semi-shaded location, filling it with open-faced flowers and pretty foliage. For sun, by all means plant some Korean mums, blooming in late October with clouds of salmon-pink or russet daisy-style flowers. Hybrid goldenrods like ‘Fireworks’ and ‘Little Lemon’ will have you feeling like you’ve struck gold (and are not responsible for allergies). Sedums bear fat, neat heads of tiny florets and, like goldenrods, are attractive to butterflies. 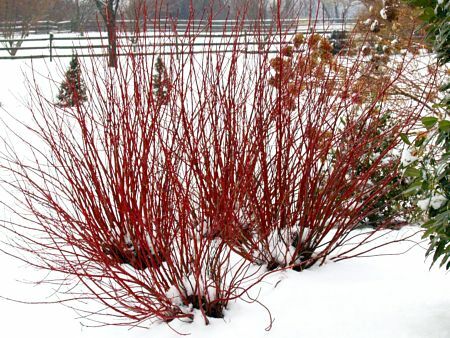 For your winter special, try one of the shrubby dogwoods with colored stems. ‘Arctic Fire’ is especially fine with bare, scarlet stems that stand out after leaf fall. When the growing season comes to an end, you’ll still have something waiting in the wings. A stand-out in snow, ‘Arctic Fire’ and similar species add a splash of color against drab green evergreens. When planning for winter interest, try to keep featured plants in view from your windows. Chances are you’ll spend the season huddled inside. The real point here is to think beyond instant gratification when in the first flush of spring planting fever. You can have something going on in the garden all through the year. With a planting plan focused on low-maintenance high-performance plants, you’ll arrive at the end of next season feeling satisfied, not exhausted. A changing array, a pageant of key players — that’s the idea to keep in mind.